Every once and a while, a new innovation comes along that makes you go, "Wow!" or, "I never would have thought of that" or, "Not sure if it will work, but I'm sure interested to find out." The following three are interesting not only because of the ideas themselves, but also because of the different ways they are going about funding: for-profit (Vital Decisions), both for-profit and not-for-profit (ResolutionCare), and non-profit (Caring Advocates). 1. 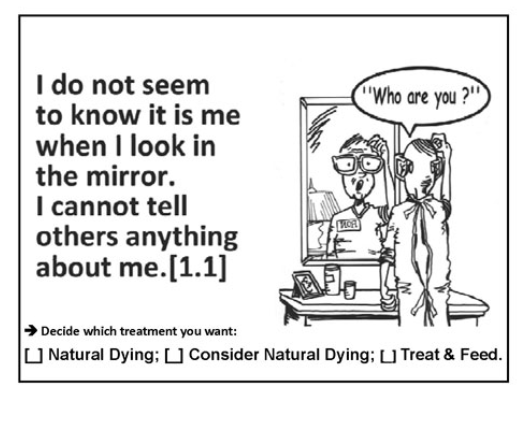 Cold calling patients with serious illness and engaging them in advance care planning conversations. Vital Decisions, a large and growing for profit company, obtains lists of patients with serious illness from insurance companies. Counselors working at Vital Decisions call patients and engage them in advance care planning conversations. NPR did an interesting story on this company in August. As Bob Arnold said at the end (to paraphrase), "would it be better if the patient's doctor, nurse practitioner, or social worker did this? Yes. But this is better than what patients have currently been getting." Major outstanding question: can you conduct advance care planning conversations effectively over the phone with someone you don't know? 2. Crowdfunding palliative care. ResolutionCare based out of Humboldt county in Northern California has launched a crowdfunding campaign on indiegogo to raise $100,000 in November. The money will go toward building a palliative care service for patients with serious illness, particularly those living in rural areas. The care model is based on Project Echo, a remarkably successful program that started at the University of New Mexico to improve care for rural patients with Hepatitis C. The central idea is that expert palliative care specialists on the ResolutionCare team will use video technology to conduct video consults with doctors and other providers at outlying practices. This will increase the reach and impact of the the ResolutionCare team, and hopefully, increase the quality of palliative care delivered by the providers who consult. Major outstanding questions: is palliative care similar enough to hepatitis C treatment that the Project Echo method will be effective? Do video palliative care consults to healthcare providers improve the quality of care for patients living with serious illness? Will people give money to crowdfund palliative care? 3. Pocket card decision aids. Dr. Stan Terman in Southern California is on a mission. His mission is to ensure that patients who later develop advanced dementia will not be forced to endure treatments they would not have wanted. His nonprofit company, Caring Advocates, has created a series of pocket cards to help people plan and make choices about the type of care they would prefer in various states of health. An example is below. He has also produced some provocative videos that might be used for teaching. For example, he made a YouTube video version of his talk at the American Society of Bioethics and Humanities titled, "Must we all die with forced hand feeding in advanced dementia?" Hard to not click on that, isn't it? Compelling story of a woman in Canada with a clear advance directive who is being hand fed despite her directive and her daughter's wishes - he has video of the patient and her distraught daughter. Major outstanding questions: do pocket cards work as decision aids? Will they be widely used? The Project ECHO model is a reasonably well tested, effective and powerful mechanism to share knowledge and improve basic Palliative Care skills in the domain of Hospice and Palliative Medicine. Well established programs at the University of New Mexico in Palliative Care and in Northern Ireland in Hospice have proven the concept. More programs like ResolutionCare are expected to come on line with Project ECHO in the next 12 months. In addition to the knowledge sharing with Project ECHO, ResolutionCare will use the same incredible team and the same straightforward videoconferencing technology to increase capacity and responsiveness for outpatient specialty Palliative Care in our community. We are choosing to care for people by house calls and virtual house calls. The same team will also offer speciality Palliative Care consultation to people living in rural communities where such assistance in not available. While we hope to restore tradition with the use of technology in people's homes and through knowledge sharing with colleagues in Primary Care, Oncology practices, etc., we are also excited about innovations in payment models that partner payers with community Palliative Care providers. I am really interested in following any research associated with the decision making cards. I am a speech-language pathologist that treats patients with dementia and dysphagia. While it is out of my scope of practice to recommend tube feeding, I can recommend NPO due to aspiration/choking risk. I am the person who sits with families and explains the risks of continuing to eat or the reason why in dementia people stop eating. In individual conversations, I want the family to make the best decision for them. However, overall I am an advocate for no PEG tubes in advanced dementia or other progressive neurological disease. This is due to the the negative sequelae I see after the PEG tube - confusion after anesthesia, reduced strength after a hospital stay, inability to understand why they need the PEG tube and attempts (or success) in removing it, which leads to chemical restraint use. Thanks Bob Arnold (rabob), Michael Fratkin, and Rachel Wynn for your comments. Bob - it certainly sounds like they engage patients in advance care planning. From their website under "what we do"
"Our expert counseling staff serve as navigators for your healthcare decision making. Through a series of telephone conversations, we review your medical situation, understand what is important to you, and help you develop a plan to address the many healthcare decisions you may face now or in the future." "The counselor helped the patient understand that he could communicate to his doctors his desire to remain out of the hospital while better controlling his symptoms. They discussed how explaining his priorities to his physician would help make sure his care plan continued to match his preferences for being at home and retaining some dignity and independence. Together the patient, his wife, and the counselor created a plan of next steps to ease the feeling of being overwhelmed and help the patient regain control of his medical choices and how he will live his life while dealing with his disease." So, sure they're encouraging the patient to tell the physician "these are my decisions." But the most important part, the advance care planning conversation, happened over the phone with the counselor. At the very least, the conversation was started and significant progress made over the phone. I'm not saying it's wrong or won't or doesn't work. In fact, it may be easier to talk with an anonymous caring person over the phone than your doctor who may have pre-conceived notions of extended life at all costs. I'm skeptical but open. Rachel - look for a post about speech pathologists and palliative care on Pallimed soon! I wrote it and sent to them to post as part of our wager on the world series.